Born in 1909, William G. Rohrer grew up in Williamsport and Pottsville, Pa. He moved to Camden County, N.J., to establish with his father the Rohrer Chevrolet Agency. He operated the dealership for 50 years, building it into one of the largest automobile dealerships in southern New Jersey. A resident of Haddon Township since 1929, Mr. Rohrer served as a committeeman for four years and as mayor for 36 years. He launched the First People's Bank of New Jersey in 1956 and served as its president and chief executive officer until 1982 and later as chairman emeritus of the board of directors. He also established and was president of Wm. G. Rohrer Inc., a real estate holding company and served as president or partner in several other real estate development companies. Mr. Rohrer was past president of the First National Bank of Stone Harbor and the Fidelity Bank of Pennsauken. The desk of the late William G. Rohrer, the township's first mayor who served 36 years, is on display at the Rohrer Memorial Library, off Cuthbert Boulevard in Westmont. When township residents visit their local library, watch a local ballgame or visit a senior citizen at the high rises on Haddon Avenue, the spirit of Bill Rohrer is with them. The 6-foot-tall Rohrer, who died in 1989 at age 79, was an imposing figure in more ways than one. He lived in the township for 60 years and served on its commission for 40 of them, including 36 years as its first mayor. For decades, he held court in the main branch lobby of First Peoples Bank, the bank he founded in 1956. There, many a loan was said to be settled with a handshake. Today, the building at Cuthbert Boulevard and MacArthur Drive bears the name of First Union, but the library erected just across MacArthur in 1993 is called the William G. Rohrer Memorial Library. Its reading room, dedicated to the mayor, overlooks his old bank parking lot. "Bill was very generous and unassuming," said Jerry DeFelicis, who served as a township commissioner from 1971 to 1991. "The Rohrer library is a good example of that. The library began in a storefront on Haddon Avenue and then moved to the municipal building. The new library was 30 years in the making." In his will, Rohrer left $600,000 to the township to build the library, which is a part of the Camden County system, and an additional $150,000 more if the library included the space to display his memorabilia. "He was as generous with his own money as he was frugal with government funds. There, he was very stingy," DeFelicis said. At the bank and at Rohrer Chevrolet, the family dealership on Camden's Admiral Wilson Boulevard, there was no sign of that stinginess. "He was responsible for starting a lot of people in business," said his daughter Linda Rohrer. 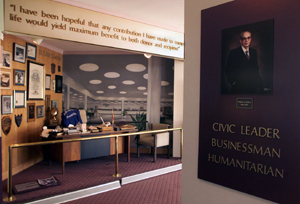 The reading room walls are lined with Rohrer's many community and humanitarian awards, as well as a 1969 Benjamin Franklin Award given by The Saturday Evening Post to the nation's outstanding automobile dealer. His years of service in Kiwanis and the Masons are also recollected. 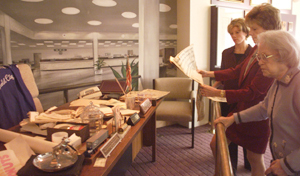 But the focal point is Rohrer's famous desk from which he did bank business, with a backdrop simulating the old First Peoples lobby. "He'd have lived there if he could have. It's a wonder he didn't have a bed there," said Floretta Rohrer, 87, who married Rohrer in 1942. Linda said her father was frustrated by a financial institution auditors' policy that requires all bank lending and executive officers to be out of the bank building for two consecutive weeks every year. The requirement is imposed on the theory that if a lender is doing something illegal, it will bubble to the top if he or she is away from the bank for two weeks. "It was torture for Daddy. He'd drive up and do business from the front steps," Linda said. Today, the cluttered desktop holds such items as a doughnut box, old newspapers featuring ads from Rohrer Chevrolet, an ashtray advertising the dealership, a $2 parking ticket stub for the Philadelphia stadium complex, a 1969 datebook and a Haddon Township High School button. A desk plaque reads: "Nothing will ever be accomplished if all possible objections must first be overcome." Linda sometimes adds items. But occasionally, she sees other new things. Three generations of Rohrer women, (from left) William Rohrer's granddaughter Stacey Borton, his daughter Linda Rohrer, and his former wife Floretta Rohrer check out the reading room of the library that bears his name in Haddon Township. It contains memorabilia from his banking days, including his famous desk. "People started bringing things I know I didn't put there. They bring their own memorabilia," she said. Born in Williamsport, Pa., the home of the Little League World Series, Rohrer was a stock boy and grocery clerk in his father's store. The family moved to South Jersey in 1919, when Rohrer's father bought the Chevrolet franchise in Camden. The Rohrers first lived in Oaklyn, but in 1929 moved to the brick Colonial on Cuthbert that was to become the family domain. Rohrer worked his way up at the dealership, beginning in the parts department, but took over as its president and chairman of the board when his father died in 1935. Rohrer was only 25 so young that he had to go to Detroit to get approval to take over the reins, Linda said. He met Floretta, whose family moved from Camden to Haddon Township when she was 5, when she went to work as a part-time secretary in his dealership. The couple, who divorced after 20 years, had four daughters. Linda, the third eldest, was born on June 13, 1947 the day her father was elected to the township commission. "He'd been asked to run before and he said `no' initially. Finally, he said, `Yes, I'll run if I can do things my way,'‚" Linda said. "Each year, Daddy asked me how old I was. That's how he knew how long he'd been serving," she said. When Rohrer was turned down for a loan he wanted to make a real estate purchase in 1956, he decided to open a bank. He purchased one in Stone Harbor and one in Laurel Springs, with $2.9 million in resources. He sold the one at the Shore but kept the other, renaming it First Peoples National Bank. In 1965, he moved his main headquarters to Haddon Township. Several years later, he quietly changed the bank's charter from a national one to a state one so he could add more branches than the national charter would allow. The name was changed to First Peoples Bank. By 1976, there were 38 offices with $600 million in resources. "I remember that he was always very involved with teaching me how to save money," recalled Stacey Borton, 26, Linda's daughter and one of Rohrer's five grandchildren. "When I was about 8, he'd throw me The Wall Street Journal and say, `Read what my stocks are doing.' I didn't have a clue what he was talking about. He was all business," she said. Linda said that about the same time, a $20 bill belonging to Stacey went missing. It turned out that Rohrer had taken it to teach the child a lesson. "She shouldn't leave money lying around," he said. When Linda was young, she recalls, she wasn't allowed to collect pennies, because her dad said banks needed the pennies. But there was a humorous side to Rohrer, as well. "He was an instigator," Linda said. Stacey remembered that during one township Halloween Parade, which takes place on Oct. 30, Rohrer was in the route and she ran out to give him a kiss. "He handed me a box with six different kinds of shaving cream," presumably to use that Mischief Night. A few blocks away from the library, the William G. Rohrer Memorial Field is a tribute to Rohrer's lifetime love affair with sports. "We would go to Phillies games together," recalled Michael Brennan, a Democrat who served on the Collingswood commission from 1973 to 1993, the last 18 of them as mayor. "He wasn't the world's best driver, but he'd insist on driving and smoking his little Phillies cheroots." Rohrer, a Republican, took his neighboring mayor under his wing. "He was just great to me, like a mentor," Brennan said. "He referred to me as `boy.' He'd say, `I'll tell you one thing, boy, don't let them talk you into rent control,'‚" referring to problems Rohrer had encountered in his own township. "He wasn't going to be buffeted by the wind. He kept an even keel," Brennan said. Aside from baseball and politics, business was Rohrer's passion. He founded a real estate company, William G. Rohrer, Inc., and was said to spur post-war development in South Jersey. The Rohrer Building, an office building at Haddon and Crystal Lake avenues, recalls the mayor's love of business. His interest in real estate was inherited by Linda and Stacey, who both work in the field. Nearby, the William G. Rohrer Towers, the twin senior citizen residences on Haddon Avenue, were the first of their type in South Jersey, noted DeFelicis, the former Haddon Township commissioner. Through the years, Rohrer developed a good-natured competition with Collingswood's first mayor, Arthur Armitage Sr., over who'd be mayor longer. Although Rohrer served on the Haddon Township Commission for 40 years, both men served as mayor for 36. Armitage, an insurance man, was mayor from 1933 to 1969; Rohrer served as mayor from 1951 to 1987. Armitage died 20 years ago at age 90, but his son still remembers the friendly rivalry. "My father chose to retire. Bill ran and was defeated. Dad was somewhat older than Bill, but they were very close. They shared a lot of interests. They were both active in the Masonic fraternity and were past potentates of Crescent Temple," said Arthur Armitage Jr., who moved "just over the line" to Haddon Township 20 years ago. Both men were workaholics who went to the office until they died. Their longevity in office probably couldn't be duplicated today, Armitage said: "The business of running a town is a lot harder now. The pace is faster, and people burn out quicker." During his career, Rohrer also served as postmaster of the Haddon Township substation. He was a commissioner on the Delaware River Port Authority and served on the Camden County freeholders' ethics committee. Rohrer remained president and chairman of the board of his dealership until the changing face of the Admiral Wilson Boulevard forced him to close in 1983. Rohrer's last mayoral campaign was in 1987, when he lost. "His health was deteriorating. He shouldn't have run. But a politician has to die with his boots on," Linda said. Two years later, he was dead. First Peoples ceased to exist when the bank was taken over by CoreStates in the 1990s. Today, it is First Union. But Rohrer's legacy lives on. Linda Rohrer counts the high school, educational scholarships, improved roads and the township's ball fields among the things he fought to establish in the township. Said DeFelicis, "Haddon Township matured commercially, residentially and educationally during his tenure. We moved from a farm town to something significant in South Jersey. It was an honor to serve with him and try to affect public policy in South Jersey. "He was a role model to everyone involved in the role of government. His philosophy was that less government is the best government. He supported individuals of both political parties. He believed in the individual and what he could accomplish," DeFelicis said.